Basically, interactive visualisations of UK governmental spending, broken down by topic or by region. There’s also a time-series function, which is quite interesting to see – overall government spending, as a proportion of GDP, has just hit the bad old days of 1992. On the whole, though, promising – definitely worth ten minutes playing with. Gets the concept across a lot more clearly than the bare figures might. One of my current projects involves rebuilding the ePrints repository system to work as a well-structured database for archiving photographs. It’s going quite well, but the problem is that I can’t really demo it to anyone – the test server has virtually no content. So, any time I have to explain how it’ll work, I keep referring them to someone else doing the same sort of thing; the SERPENT project, who’re building up quite a nice collection of photographs of deep-sea creatures which have blundered into industrial submersibles. …and then I tripped over this, a Helicocranchia squid. 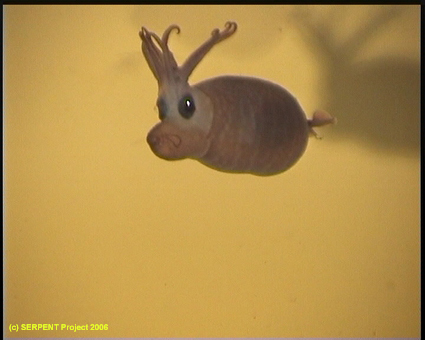 That is, in fact, a “piglet squid” – about 5-10cm long, and as the name suggests, looks like a cheerfully rotund piglet. I’m not sure quite how fads for pets begin, but that sentence sounds like a good attempt. and you should be able to deduce #4 for yourself. Stasiland is great. Absolutely, unqualifiedly, great. Well-written, moving, direct, vivid and detached; it describes horrors and terror without either dwelling on them or glossing over them, which is a rare skill. It’s a series of linked stories of daily life in East Germany – mostly East Berlin – told by former citizens, interspersed with a narrative of life in contemporary Berlin as the author tracked them down. She deliberately included interviews with ex-Stasi members, some devoted and some compelled, which provides an interesting second layer to the reminiscences. Following on from Stasiland, I read Timothy Garton Ash’s The File a few months later. It was an interesting corollary, an attempt by a privileged observer – a Western historian – to trace back his time in East Germany through studying his file, to trace back the contacts with bystanders and informers. The problem is that neither is the book you’d really want to read; Funder tells a lot of stories second-hand, and Ash tells his own story and those entwined with his, but we never quite get a first-hand memoir of someone who actually lived under the regime and couldn’t, as Ash could, walk away. Suggestions for further reading on East Germany, either from a social or a historic perspective, appreciated. On a lighter note, Ben Lewis’s Hammer and Tickle was enjoyable as a jokebook and a vaguely serious study of humour in adversity – I did like his idea that you could follow the trajectory of people’s faith in The Whole Grand Communist Project by looking at the tone of their jokes about it – but could have done with cutting out the 20% of padding about the author’s private life. Perhaps best just to read the original essay. …which means it’s time for some coffee.